Choose one of our standard National Register Plaques to commemorate your home, property or building. These plaques use standard sizes, colors, mounting and wording. Customize your National Register Plaque with the addition of your house name, date it was built or even address with three additional lines of text included in the price. These plaques come in sizes 7×5, 9×8, 10×7, 11×8 & 15×12. Make your mark with our custom bronze plaques and custom aluminum plaques. From historical markers to governmental seals, our team can customize any plaque to meet your needs. Give a gift that will last. Our aluminum gift plaques and bronze gift plaques make a perfect for any occasion. Remember your loved ones with a timeless, bronze cemetery marker that can withstand the test of time. Our bronze grave markers can feature customized wording, emblems and pattern to personalize a memorial. 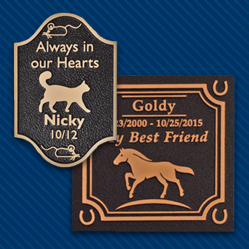 Choose one of our 10 pet memorial plaque designs or work with us to customize a plaque to memorialize your lost animal or pet. Preserve the history of your community with one of our aluminum time capsules. Our time capsules come in two sizes 12x12x24 or 12x12x18. Commemorate a park bench or a special project, label a special piece of art, or affix your business card to a finished project. All this and more is possible with one of our stainless steel bench plaques. Our foundry has been casting Navy Ship Plaques for over 30 years. We have over 150 ship insignia plaque patterns in stock for both current and decommissioned ships. Metalphoto allows for reproduction of photographs onto photo sensitive Aluminum. Some touch-up can be done on old photos. The main difference between Metalphoto and Etched Photos is that a Metalphoto is smooth to the touch where an etched photo has raised and lowered areas due to the etching process. Our Metal and Etched photo’s can be ordered as “stand alone” plaques, or they can be epoxied to your plaque.